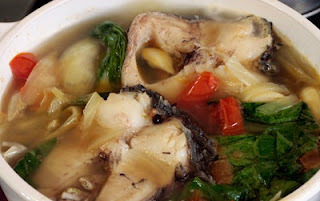 The success of this simple fish soup depends on the freshness of the fish and the ginger. 2 Boil the rice water, ginger and peppercorns for 5 minutes. Add the onion and cabbage, and simmer for 3 minutes. 3 Add the oil, salt, fish sauce and ground pepper, and boil for another 2 minutes. Reduce the heat, add the fish and green vegetables, and simmer for 10 minutes. 4 Ladle the stew into a large serving bowl, garnish with leek or spring onions and serve with the Miso Tomato Sauce on the side.